Where to start…. It is difficult as there are so many things to mention and people to thank. First of all, J&A. There were an amazing, caring and extraordinary couple to work with. The planning process was not difficult as they knew what they wanted. They trust us 100% to guide them and suggest the best suppliers to make their dream come through. We still remember the first meeting at a “chiringuito” in Marbella where they gave us their mood boards explaining the wedding that they were envisioning, they were so organized! We, as planners, we wont be able to do the job on our own. Many suppliers were involve in this wedding to make it happen. A big part of this wedding were the styling, flowers and decoration. When J&A show us their mood boards we knew whom had to do the job. 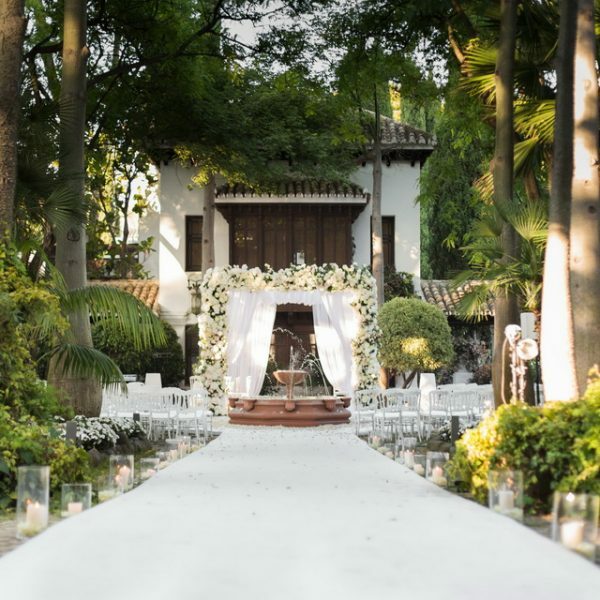 Pedro Navarro Estética de Espacios was the perfect supplier to do this amazing wedding and we were not disappointed. For one year, Pedro Navarro and us were working to make sure that every single detail was looked after. All this team and ours worked very hard to achieve the result that we had on the day. The stationary as well was a big detail in this wedding and of course Nulki Nulks was involve from the beginning. They did the save the date, engraved stones, invitations and all on the day stationary (paddle fans, confetti cones, programmes, signs, table seating plan, table numbers, favours, menu cards). We can have the best decoration, stationary, venue but if we don’t have a good photographer, all the work is worthless. We knew that Romance Weddings could capture those details that we worked so hard to achieve and here you can see how beautiful everything was. This album is just the first part of the wedding that took place at the amphitheater of Villa Padierna Palace Hotel. More pictures to come to show you the other part of this breathtaking wedding.